The IMMUNOSET® p53/MDM2 Complex ELISA development set contains sufficient reagents for the development of 5 x 96 well EIA plates which provides analysis of ~200 samples in duplicate. Save time, money, and sample by developing your own EIA kits. Simply coat your plates and go! This kit provides superior accuracy with fully quantitative results compared to Western blot analysis and has low reactivity with related molecules. 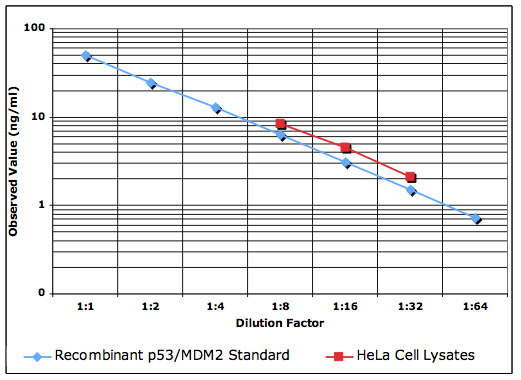 Application Notes: For the measurement of p53/MDM2 complex in cell lysates of human, mouse, and rat origin. Crossreactivity: This assay detects p53/MDM2 and does not show significant reactivity with human p21 or Bax. Scientific Background: The p53 tumor suppressor protein is a transcription factor that regulates a variety of biological functions including growth arrest, apoptosis, DNA repair, and differentiation. MDM2 is the principal antagonist of p53, and evidence suggests MDM2 gene amplification is found in about 7% of tumor tissues. MDM2 acts as an E3 ubiquitin ligase, cooperating with p300/CBP in the ubiquitination and subsequent proteosomal degradation of p53 in the cytoplasm and nucleus. Various strategies for cancer therapy involve activating the apoptotic and growth suppressive functions of p53 by disrupting its association with MDM25.